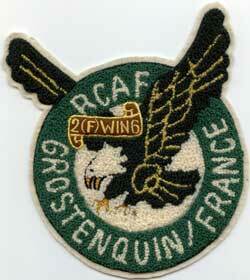 RCAF 2 Wing station crest (source). 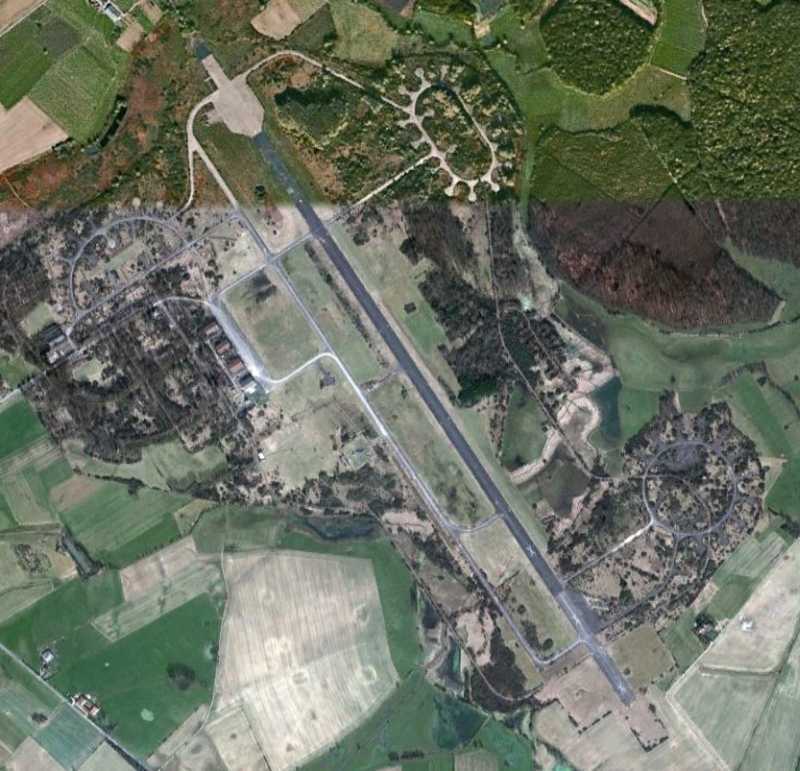 Air field Grostenquin (french: Base Aerienne Grostenquin, also known as 2(F) Wing Grostenquin or RCAF Grostenquin) was an airfield 320km east of Paris, France. The airfield was built in the early 1950s in response of NATO reaction to the perceived threat of the Soviet Union. 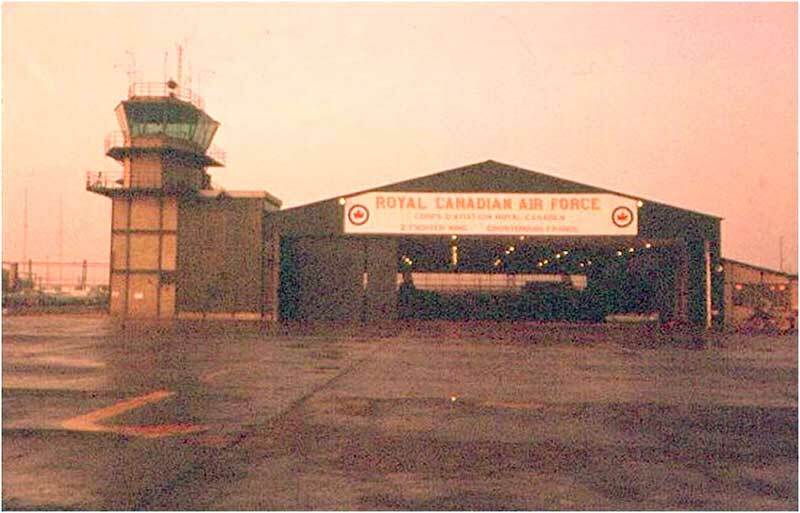 It was one of 4 Canadian air bases in Europe and part of the First Canadian Air Division, as part of Canadas contribution to NATO. 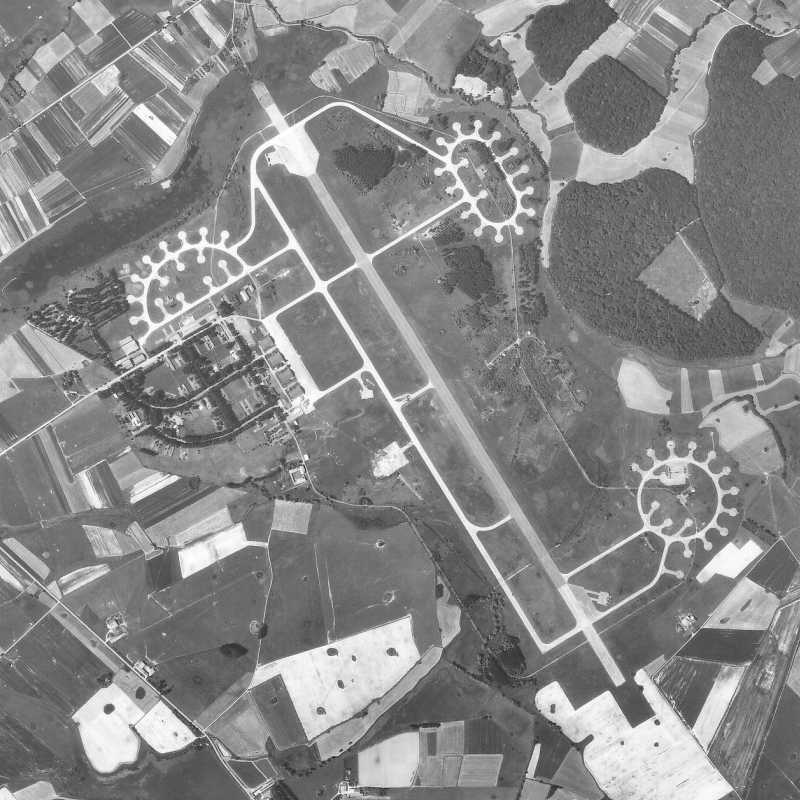 Operations at the yet uncompleted airfield (although the French constructors considered it finished) began in October 1952. Three fighter squadrons (416, 421 and 430) operated from three 'marguerite' dispersal areas. From their arrival in France (the people at Grostenquin were the first Canadians to arrive) the squadrons operated the F-86 Sabre. The flight line at 2 Wing. 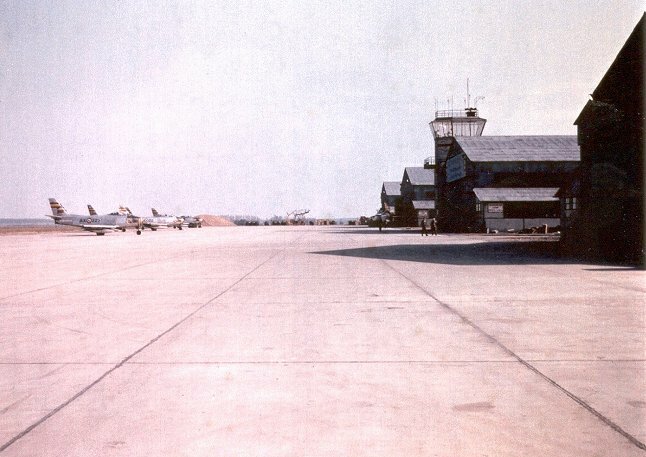 The first hangar on the right had been assigned to 421 Squadron "Red Indians" - April 1953 (Lloyd Skaalen). 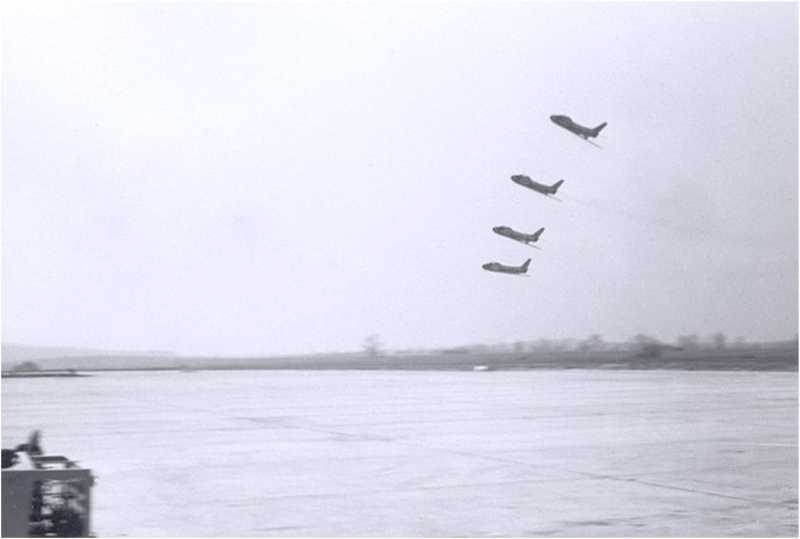 Sabres of 430Sqn break over the 416Sqn dispersal in March 1953 (image via the now defunct grostenquin.org). 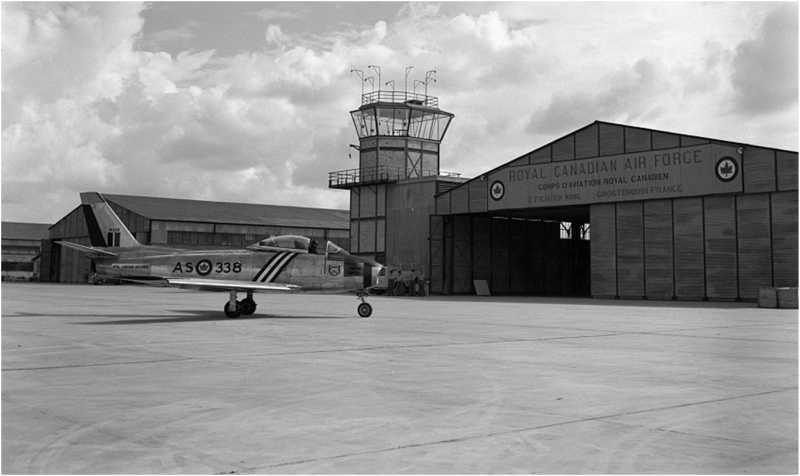 Grostenquin tower and hangar with a Sabre on the platform in June 1953 (Canadian Forces Joint Imagery Centre PL-80296, via the now defunct grostenquin.org). 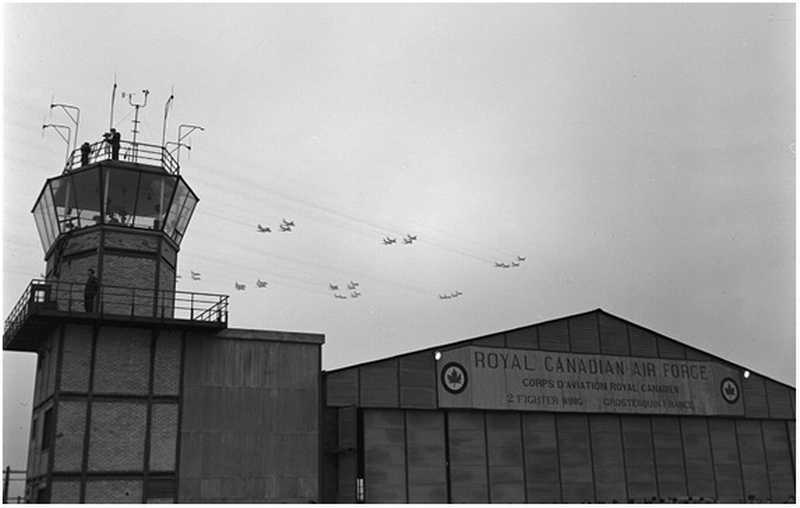 Flypast of Sabres during a Ministers' Visit to 2 Wing on 11 Feb 1953 (Canadian Forces Joint Imagery Centre PL-80598, via the now defunct grostenquin.org). 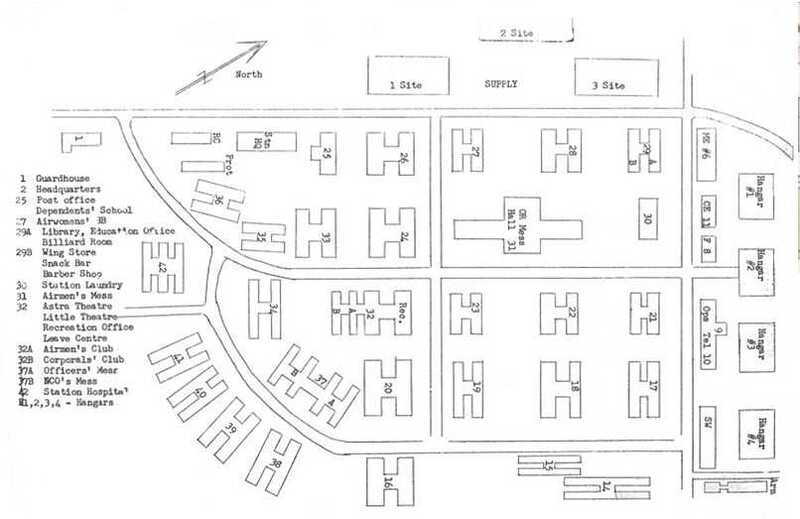 Map of the logistics site in 1953 (National Archives of Canada, via the now defunct grostenquin.org). 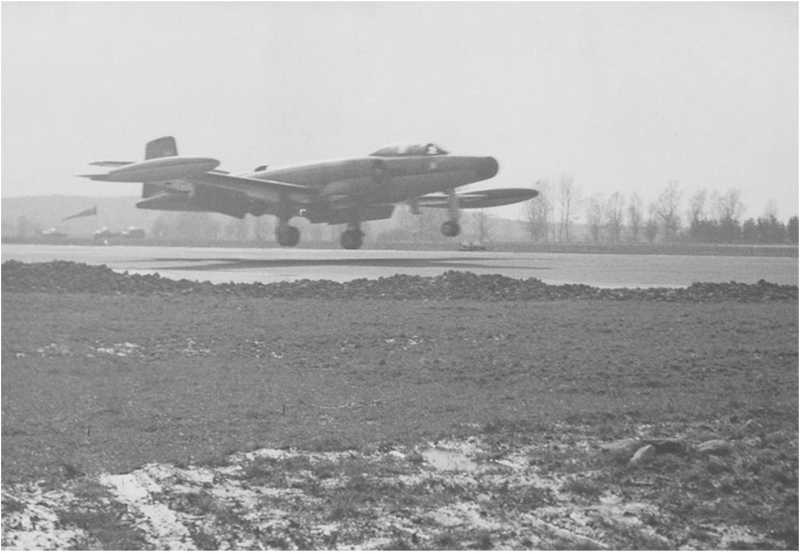 During the first winter the air base was a large mud pool. Fortunately grass soon began to grow between the barracks, as can be seen in this 1954 photo. 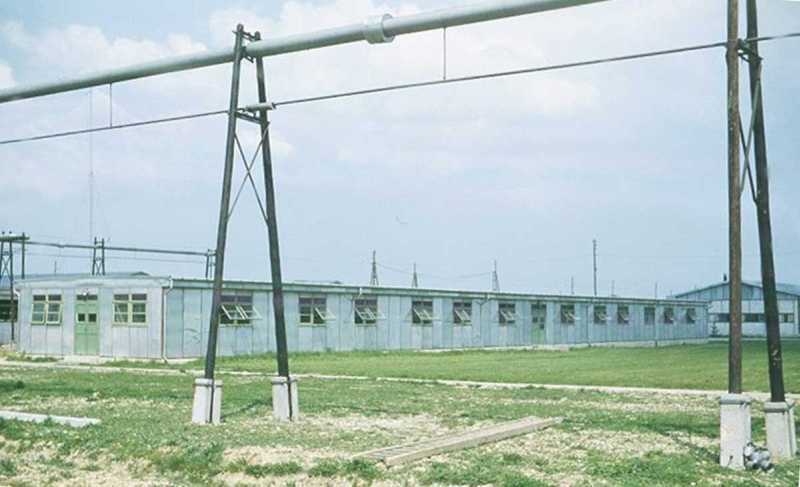 The pipelines belong to the base heating system (photo via the now defunct grostenquin.org). Grostenquin control tower in 1954 (photo via the now defunct grostenquin.org). 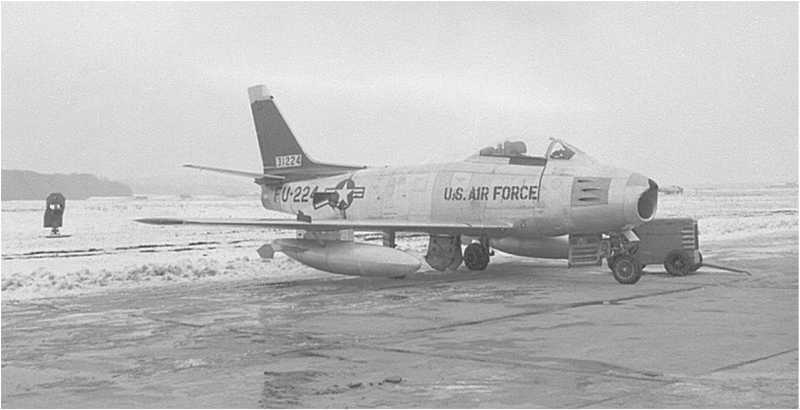 A visiting USAF F-86 parked at the 416Sqn dispersal in Jan 1955 (Len Wickens, via the now defunct grostenquin.org). Composite photo of RCAF Grostenquin in April 1955 (IGN, via Géoportail). 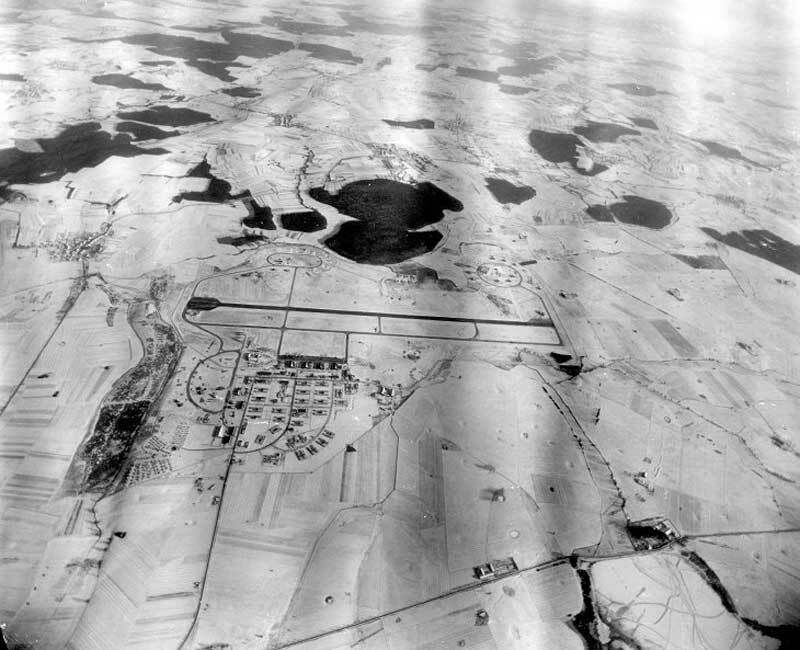 The RCAF Grostenquin logistics site in 1955 (photo via the now defunct grostenquin.org). 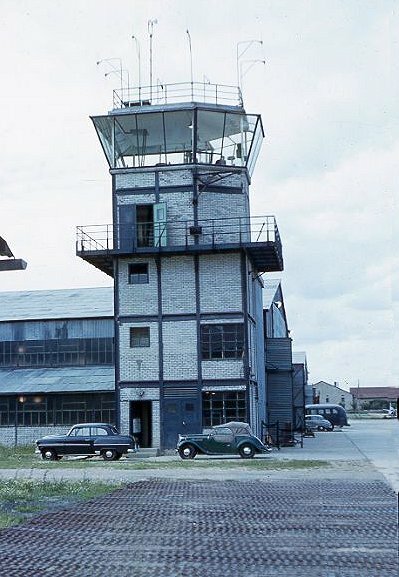 The Grostenquin/2Wing tower and hangar in December 1957 (Photo: DonNorrie, via the now defunct grostenquin.org). 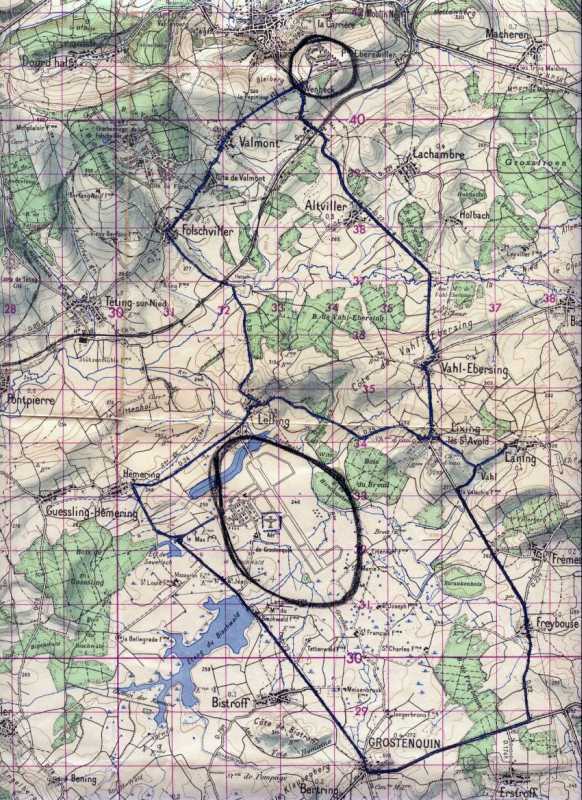 1958 map indicating the position of the airfield, the living area for the Canadian staff, and the routes between them (image via the now defunct grostenquin.org). 1958 photo of Grostenquin (IGN, via Géoportail). "I was employed in Wing Instrument Flight for a period of time during my tour at 2 Wing. One of our T-33 aircraft made a trip to England and it encountered "fuel problems" on the return flight. As a result, it made an emergency landing at the American base in Landstuhl Germany. The pilot managed to land the aircraft without any difficulty, but departing would prove to be another story due to the short runway and the fact that the airport was surrounded by mountains. After a great deal of discussion, groundcrew came up with the idea to use JATO bottles. It deserves mention that not everyone appeared to be in favour of this suggestion. Sgt Hay and Roger Charlebois convinced the CO and they got a "green light" to proceed with the trial. 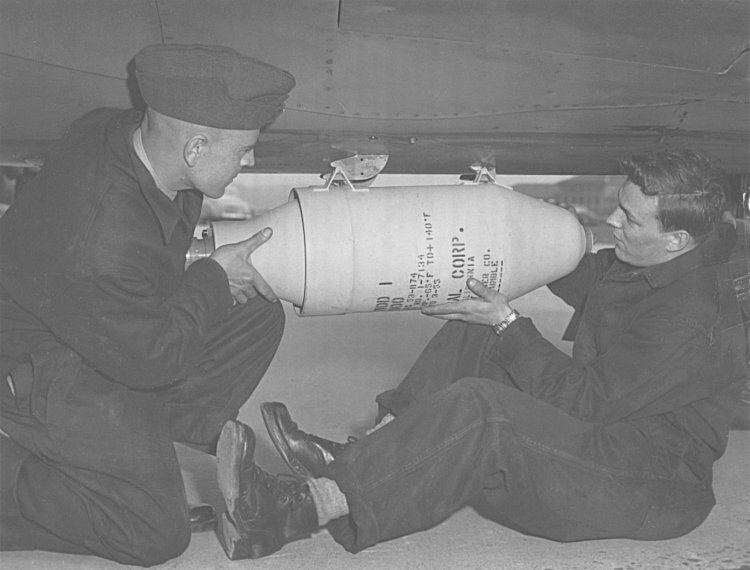 It took them about a week to prepare the aircraft circuits and to obtain the right JATO bottles. We briefed the pilot as to when to activate the JATO. As can be well imagined, all kinds of bets were made between American and Canadian military personnel. The T-33 was warming up on the very short runway about 2:00 in the afternoon. Sgt. Hay and Roger Charlebois were standing about 100 yards away. We gave the pilot, who had volunteered for the flight, the signal to push the JATO button which would activate the bottles. Everything went off without a hitch and the aircraft cleared the mountains with lots of separation. Sgt Hay and Roger Charlebois were eventually commended by their Commanding Officer." 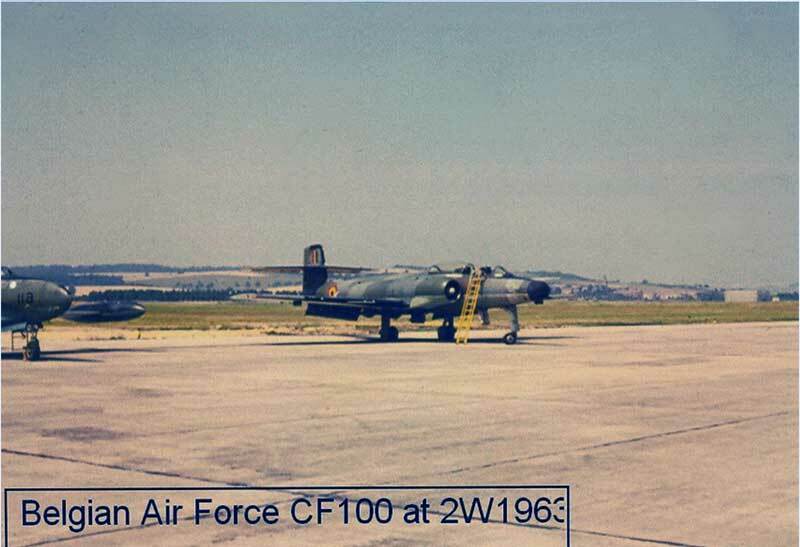 In 1956 the decidion was made to withdraw one F-86 squadron per base, and replace them with a Avro CF-100 Canuck equipped squadron. 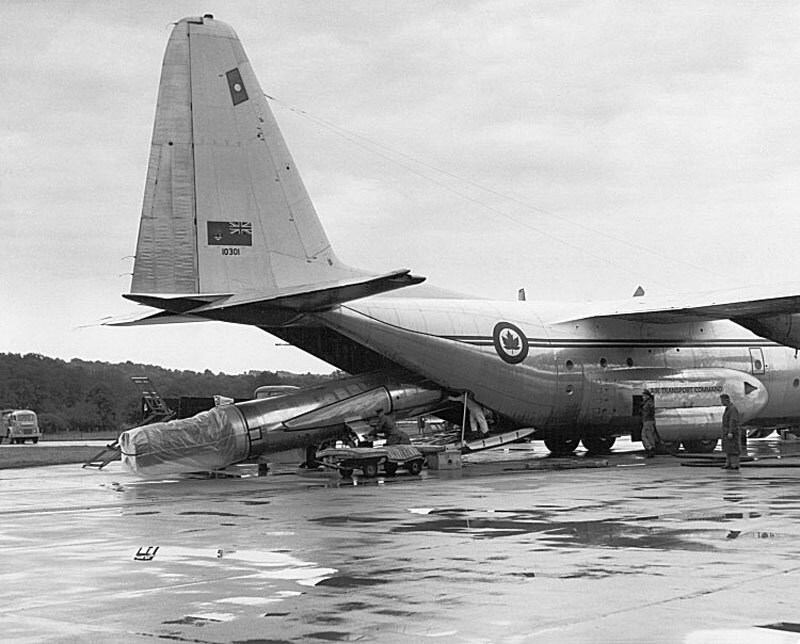 For Grostenquin this meant it was to loose 416 Sqn, which was replaced by 423 Sqn. 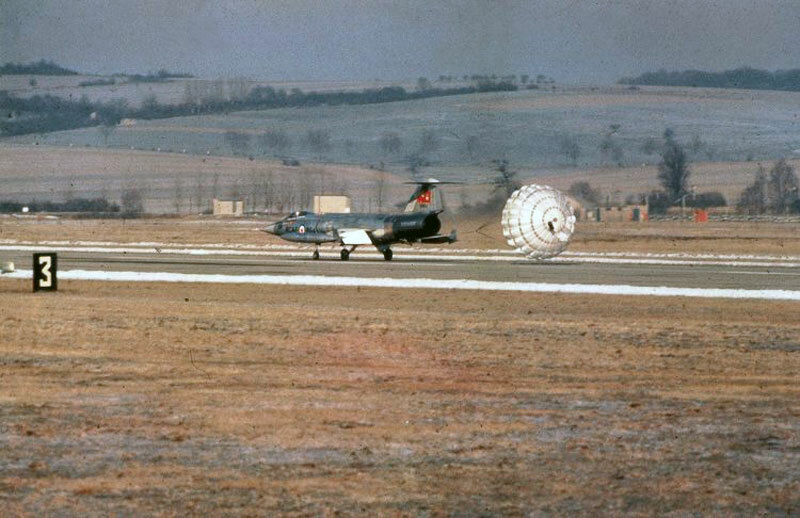 Arrival of the first CF-100 at Grostenquin (photo via the now defunct grostenquin.org). 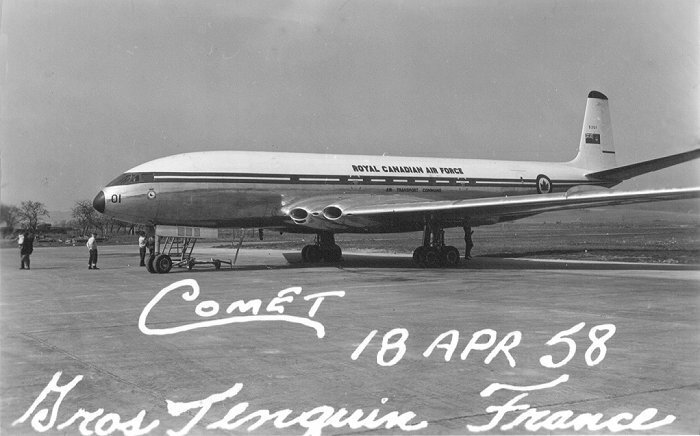 A RCAF DeHavilland Comet at Grostenquin on 18 April 1958 (photo via the now defunct grostenquin.org). 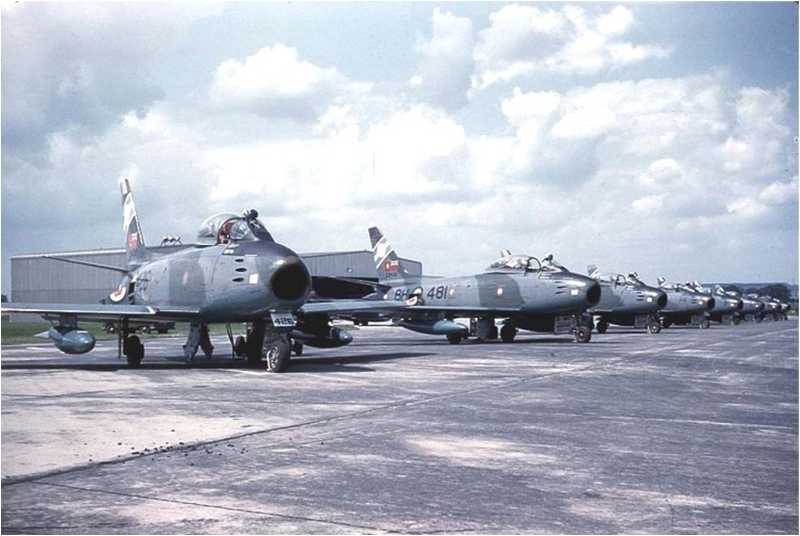 Sabres on Zulu alert in June 1960 (photo via the now defunct grostenquin.org). 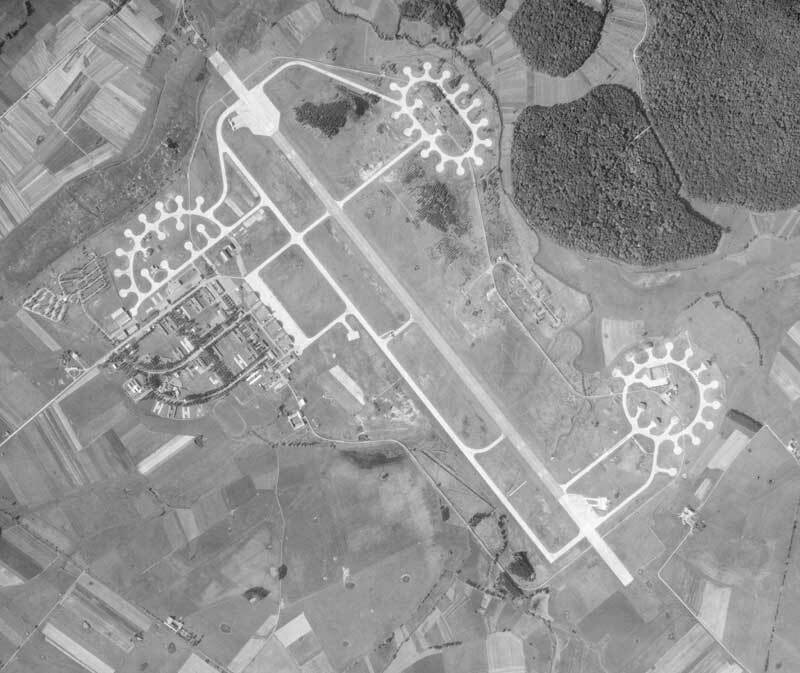 Aerial overview of the airbase in 1960 (collection Ren L'Ecuyer, via the now defunct grostenquin.org). One of the problems of Grostenquin was that it was prone to flooding. 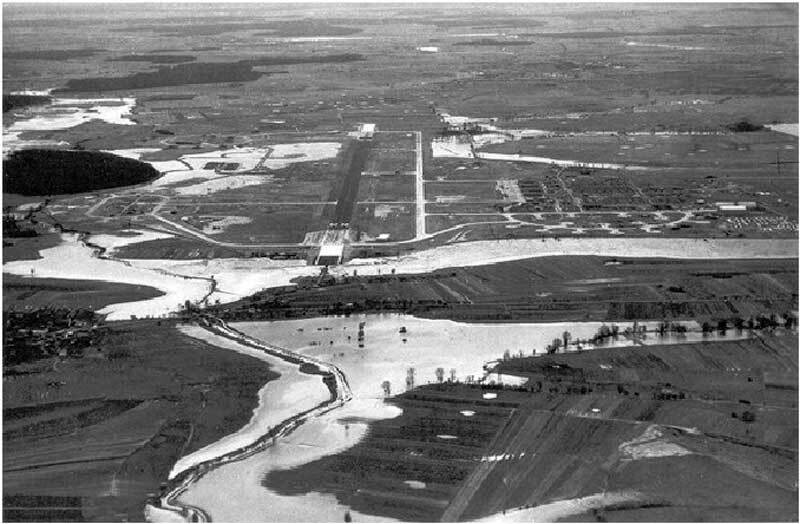 In this October 1960 photo it is clear the air base only just managed to remain dry (photo via the now defunct grostenquin.org). Grostenquin, June 1961 (collection Ren L'Ecuyer, via the now defunct grostenquin.org). 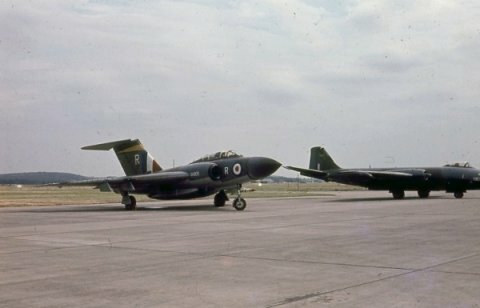 423 Sqn practising to fly the Lorraine cross in 1961 (photo via the now defunct grostenquin.org). 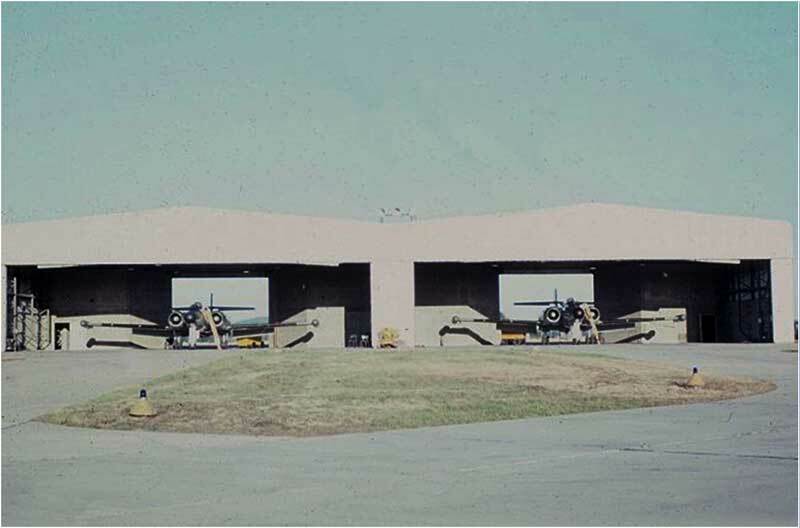 Two CF-100s at their alert shelter in 1961 (photo via the now defunct grostenquin.org). 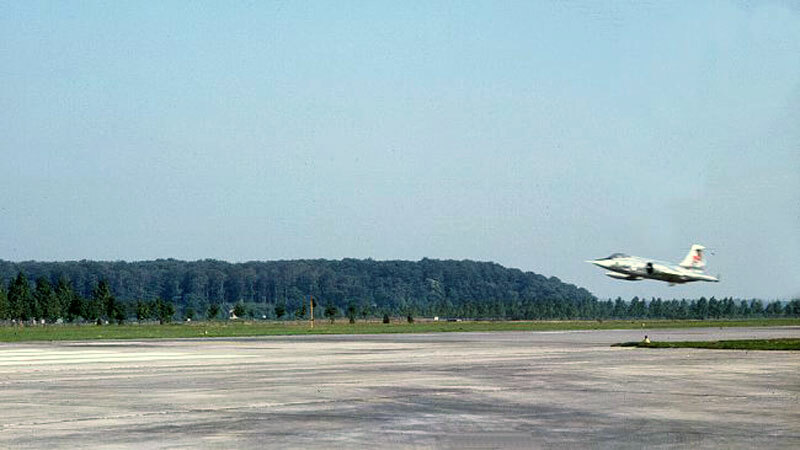 A Belgian CF-100 visiting Grostenquin in 1963 (photo via the now defunct grostenquin.org). September 1961 photo of an alert scramble at the Zulu platform (photo via the now defunct grostenquin.org). In 1959 Canada controversially adopted a nucleair strike role in accordance with NATO's 'limited nuclear warfare' doctrine. As a result Grostenquin began preparing for the F-104 Starfighter, which could deliver such weapons. As a secondary role the aircraft served as reconnaissance aircraft. In the fall of 1962 the Sabre squadrons began to be reequipped with Starfighters. 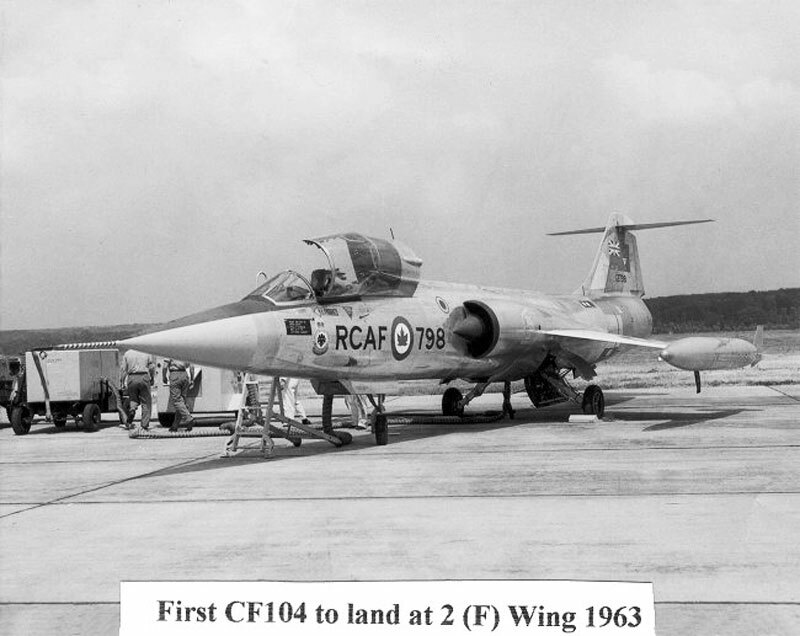 At the same time the CF-100s were withdrawn and 423Sqn disbanded on 31 Dec 1962. The NATO bases in France were short-lived. In 1963 French president De Gaulle announced that all nuclear weapons on French soil were to be placed under French control. The RCAF (and other NATO forces in France) found this unacceptable, so the two nuclear Strike Squadrons were hastily moved to Germany. 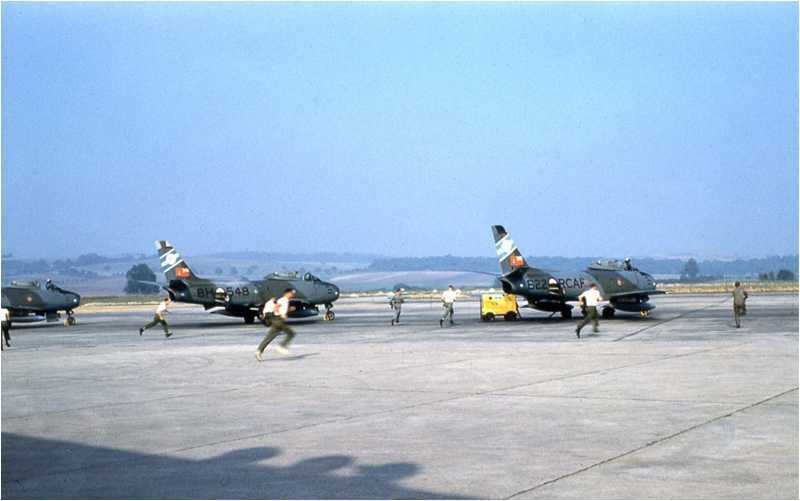 430Sqn stood down on 30 September 1962 and reactivated at Zweibrücken on 24 February 1963, while 421Sqn converted to the Starfighter in the summer and autumn of 1963 and then moved to Baden-Söllingen on 5 Feb 1964. The transports of 109 Communications flight moved to Marville air base. Without its flying units the air base had little use and the Canadians left the base in 1964. 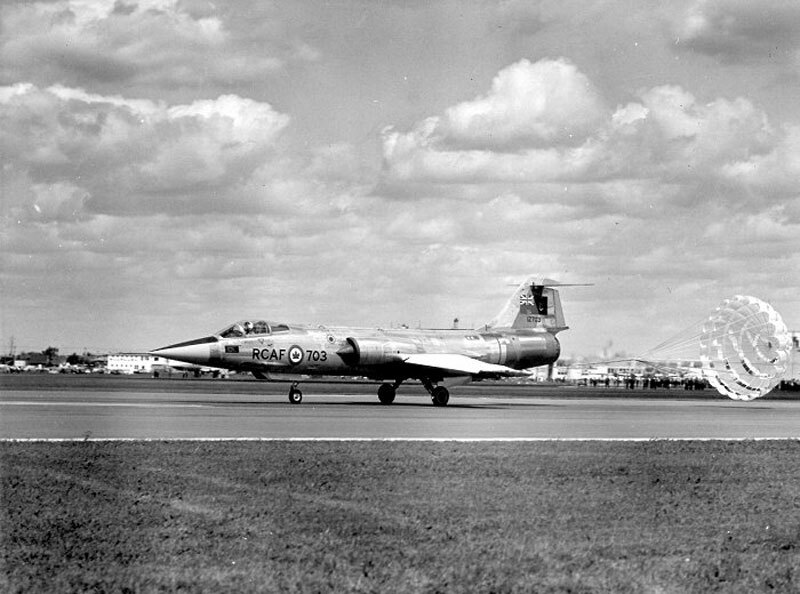 Crowds are gathered in the background to see the new CF-104s deploy their dragchutes upon landing in August 1963 (photo via the now defunct grostenquin.org). 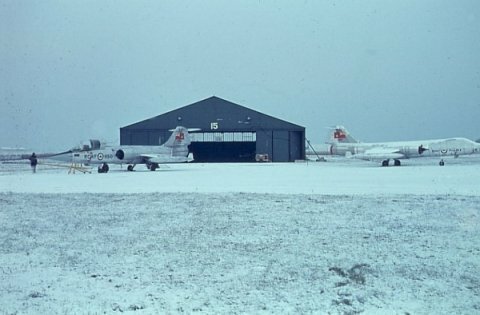 2Wing CF-104s on a snow covered Grostenquin platform (Canadianwings.com). 2Wing station flight (109 Comm. Flight) C-47 Dakotas (Canadianwings.com). Visiting RAF aircraft: a Gloster Javelin fighter and a Canberra bomber on the platform at Grostenquin (Canadianwings.com). A little known flying unit at Grostenquin was 109 Communications Flight. 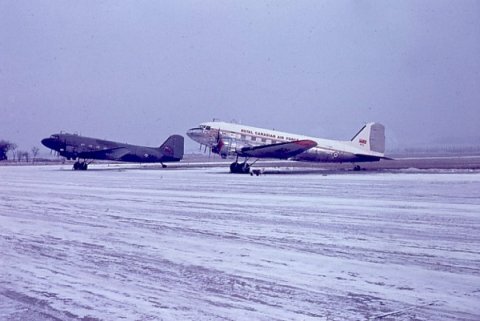 This unit operated a Beechcraft C-45 Expeditor, two Bristol freighters and 3 or 4 C-47 Dakotas (photo via the now defunct grostenquin.org). 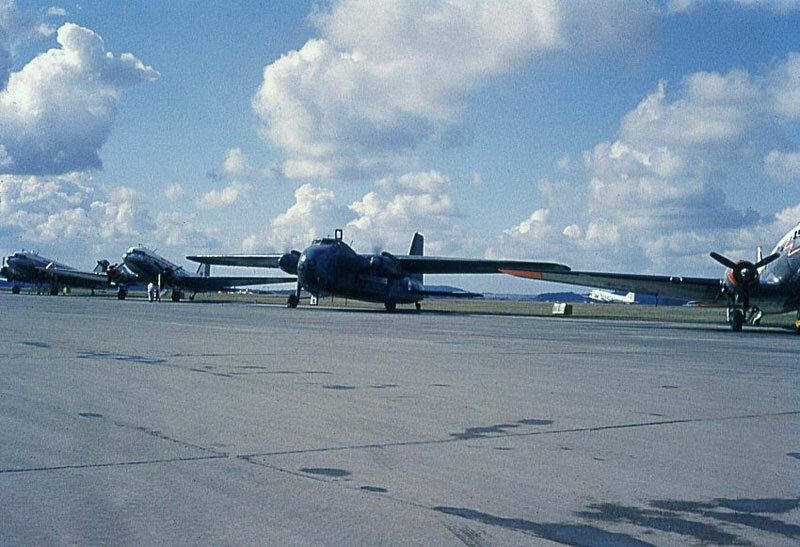 Grostenquins 109 Communication Flight, Aug 1962, showing a Beech 18 and a C-47 Dakota (photo via the now defunct grostenquin.org). 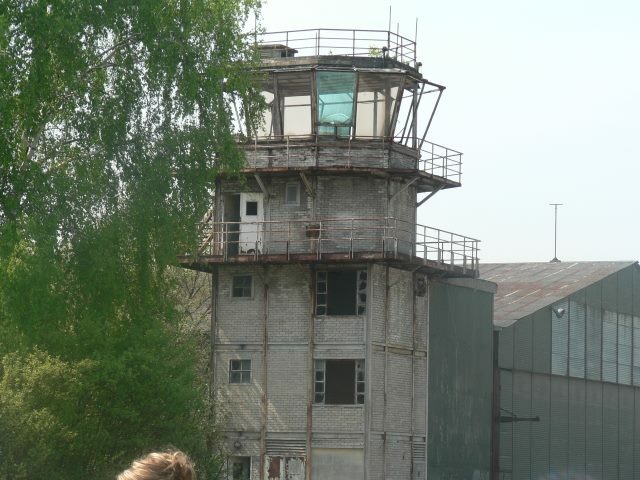 Control of the base was handed to the French Armed Forces who left the base abandoned for years. 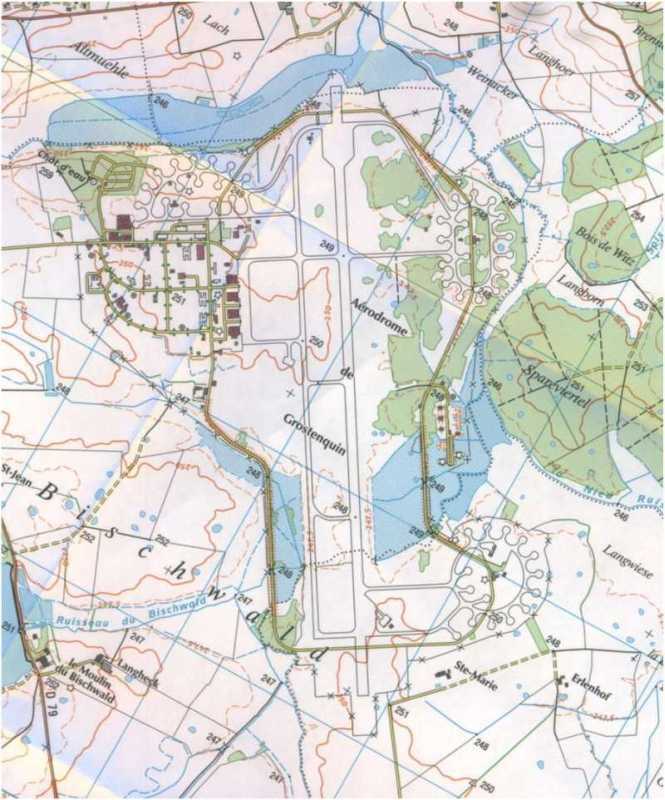 It was not until 1979 that it was put back into use (together with the former US Air Base at Chenevières), this time as an electronic warfare training range, called 'Polygone'. The 'Polygone' range is being used by the French Air Force, the Luftwafe and the U.S. Air Force. At the former air base a range of Soviet equipment was set up: Missile simulators, tanks and a range of other vehicles. Many of these were taken from former East German equipment that became available after the German reunification. In March 2010 the airfield was used for an exercise of the French Army Aviation Corps, which operated from the field with a number of helicopters (Gazelle and Puma). 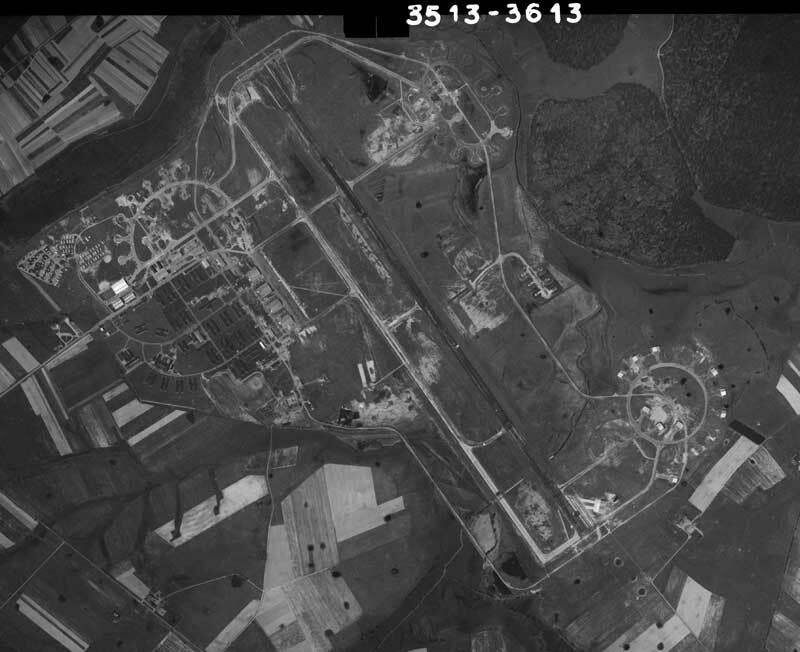 From aerial photography shot in March 2011 it appears that the runway, taxitrack and platform have (at least partially) been put back into use. The runway has received a fresh layer of asphalt, and some marks were applied to indicate the area to be used. 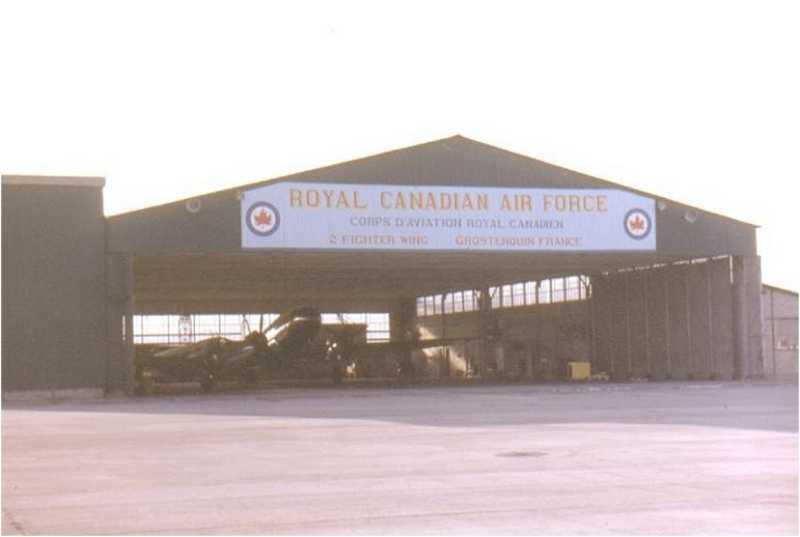 Grostenquin in 1968, only afew years after the Canadians had left the airbase. 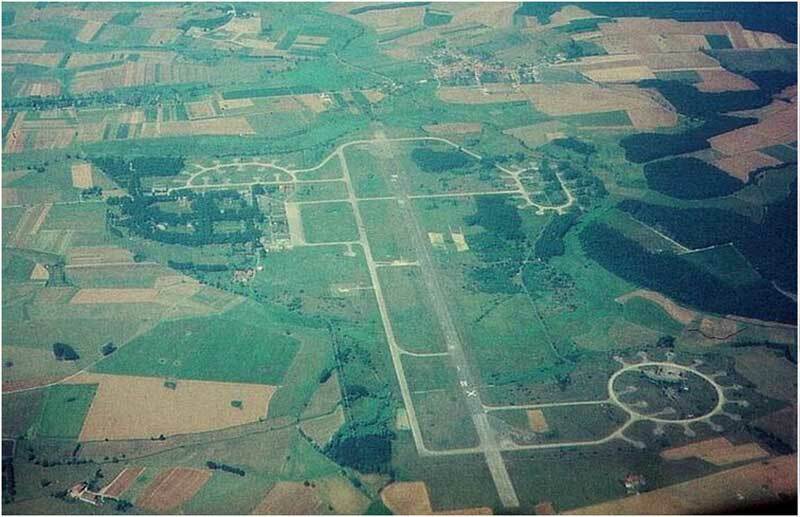 Although the French did not use the airfield, the photo shows no X-markings (for CLOSED) on the runway (IGN, via Géoportail). 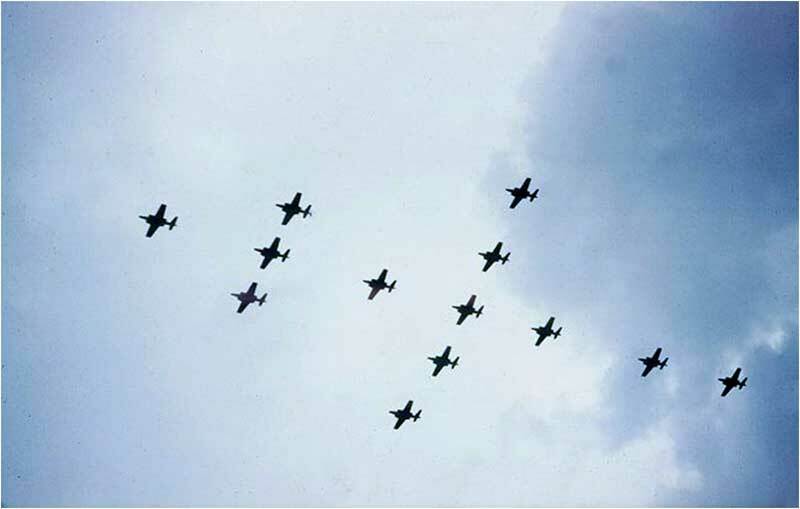 Klaus Kropf shot this photo of Grostenquin in 1993 while on approach to Saarbrucken. 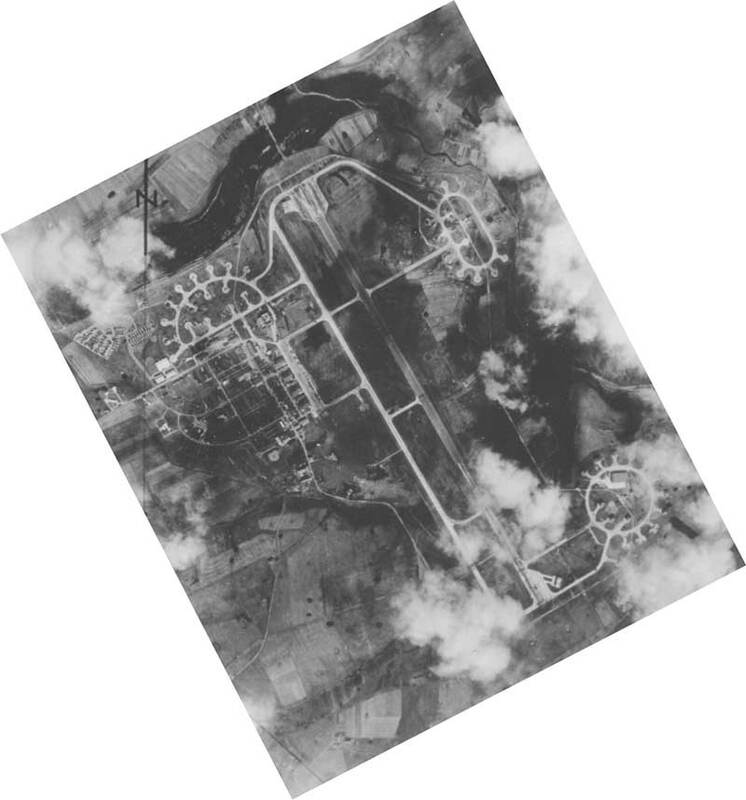 It shows two large X markings on either side of the runway and what appears to be a smaller runway painted on the west side of the main runway (photo via the now defunct grostenquin.org). 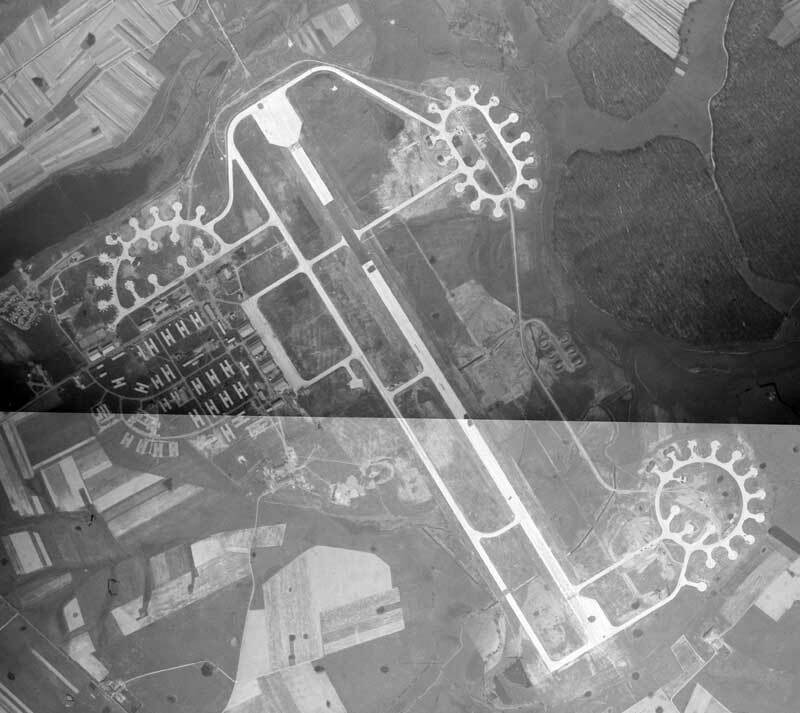 2011 Google Earth image of Grostenquin, showing several large X markings on the main runway. When enlarged on Google Earth several taxi tracks appear to have gained their own X marks, and rudimentary landing markings have been painted on the main runway.